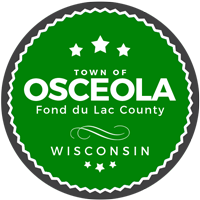 Notice is hereby given that the zoning board of appeals of the Town of Osceola, Fond du Lac County, Wisconsin will hold a public hearing at the Town Hall on Wednesday, September 19 at 7:00 pm. The board will consider a request for a variance to move a storage shed from one tax parcel to an adjoining parcel on Lake Sheehan Lane. The applicants are Larry and Kelly Leider, W1006 County Rd B, Campbellsport, WI 53010. All interested persons may appear and will be heard.